It would be wise to expect a Service Bill of Rs 10,000 to 12,000 on an average in 15000 Kms or 12 Months - while maintaining Skoda Rapid. Note - Service Costs expects to be increased year on year. how many bucks i have to spend for maintenance of rapid petrol version for one year ? because iam planning to buy that car. how many bucks i have to spend for maintenance of rapid petrol version for one year ? because iam planning to buy that car. 12k for just the regular servicing. I just comleted 70000kms with Rapid Ambition plus 1.6 TDI. Problems started from wheels and I am fed up with my car. I am thinking of buying a new car from other manufaturer. Atish this is wrong price. The cost of timing belt of skoda rapid deisel tdi is rs 700 only. I also a owner of skoda rapid tdi ambition plus 2013 and recently i hv changed timing belt by skoda authorized garage. Dont waste money. The Cost of Timing belt is 20k these people don't give us specific info , they just tell some price and when we revert then they adjust the price. Skoda has one of the worst servicing processes. They keep customers in confusion. They wont provide enough details. Withing warranty period they don't make any changes nor do they alert and let the car push with wearing out spare parts, once the warranty period expires they start replacing parts with multiple reasons. While marketing they said SKODA RAPID is wholly built in India and spare parts costs would be like other companies , just imagine timing belts cost 20K , I checked online and timing belts costs are starting from 5k to 10k for reputed brands. It depends on the service center near you. In my case, those guys did not honour anything even during the normal warranty period. They just turn the blame on you or fabricate a reason to deny. My suggestion would be to buy a roadside assistance alone as it comes handy all the time. Not from Skoda but from any other reliable provider. I am the second owner of my skoda rapid 2012, so I have not done much servicing for the same. However one of my friends is using a new skoda octavia, have heard him complain a lot about his Autobahn service centre in Mumbai. 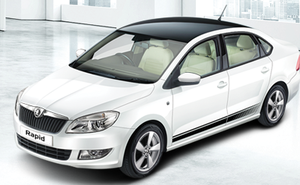 Hi, I am the second owner of my skoda rapid 2012, so I have not done much servicing for the same. However one of my friends is using a new skoda octavia, have heard him complain a lot about his Autobahn service centre in Mumbai.